General Hospital (GH) spoilers for the next two weeks tease that some startling developments are on the way. The week of September 10-14 will bring peril for Kristina (Lexi Ainsworth). After Julian (William deVry) smells a gas leak at Charlie’s Pub, he’ll order everyone out of the building. That includes Mike (Max Gail), who’ll be behind this stunning sabotage in the basement. Kristina will put the clues together and head downstairs. She won’t want to see the pub blown to smithereens if she can help it. Later, Sonny (Maurice Benard) and Julian will watch the place explode in horror. They’ll worry that Kristina might’ve suffered a grim fate inside, but she’ll survive the blast. She may escape in the nick of time or perhaps face some minor injuries, but she’s going to be fine. Later, Kristina will confide in Sam (Kelly Monaco). She might share the explosion ordeal or it could involve what she wants out of life. Maybe a near-death experience could be a positive thing for Kristina. She could use a sense of direction now that she’s cut ties with Parker (Ashley Jones) and intends to find her own path. Other General Hospital spoilers say Margaux (Elizabeth Hendrickson) will collaborate with Jordan, who’ll be played by Briana Nicole Henry starting September 13. They may mull over the mayhem at Charlie’s Pub. Can Sonny cover up what Mike’s done? The bigger problem might be what the explosion aftermath will expose. A cracked foundation could spell disaster! The week of September 17-21 will deliver another round of bombshells. 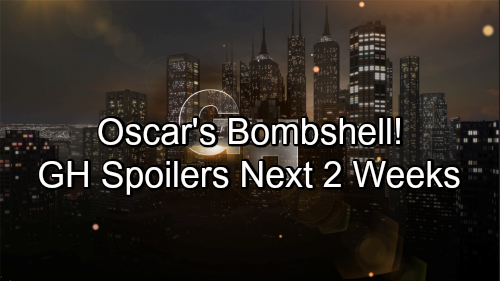 General Hospital spoilers say Oscar will get some shocking news, so it’s possible someone will fill him in on his diagnosis. Drew (Billy Miller) wants to, so he might go against Kim’s (Tamara Braun) wishes and make it happen. Speaking of Drew, he’ll come up during Sam’s (Kelly Monaco) conversation with Margaux. GH fans can expect Sam to be protective of her ex. She’ll offer a warning, so she might suspect that Margaux’s going to make trouble. Sam may contend that Margaux had better not play with Drew’s heart. He’s been through enough already. Jason (Steve Burton) will also be straightforward about his intentions soon. Could he show a little more effort with Sam? GH has been dragging their feet on a “JaSam” reunion, so it’d be nice if they could get the ball rolling. Asking Sam on a date would be a nice start. Finally, Ava’s (Maura West) temper will flare during a chat with Nina (Michelle Stafford). Is General Hospital giving these two some scenes because of Nina’s long-lost daughter plot? Kiki’s (Hayley Erin) still a contender, so you never know. Regardless, Nina will be taunted and infuriated by the end of their discussion. Ava always manages to get under everybody’s skin. General Hospital fans won’t want to miss all the action. We’ll give you updates as other GH details emerge. Stay tuned to the ABC soap and don’t forget to check CDL often for the latest General Hospital spoilers, updates and news.